Non-invasive assessment of endothelial function in humans can be determined by the flow-mediated dilation technique. Although thousands of studies have used this technique, no study has performed this technique non-invasively in rats. The following article describes non-invasive measurement of flow-mediated dilation in the brachial and superficial femoral arteries of rats. Machin, D. R., Leary, M. E., He, Y., Shiu, Y. T., Tanaka, H., Donato, A. J. Ultrasound Assessment of Flow-Mediated Dilation of the Brachial and Superficial Femoral Arteries in Rats. J. Vis. Exp. (117), e54762, doi:10.3791/54762 (2016). Arterial vasodilation to increases in wall shear rate is indicative of vascular endothelial function. In humans, the non-invasive measurement of endothelial function can be achieved by employing the flow-mediated dilation technique, typically performed in the brachial or superficial femoral artery. Briefly, a blood pressure cuff placed distal to an ultrasound probe is inflated to a suprasystolic pressure, which results in limb ischemia. After 5 min of occlusion the cuff is deflated, resulting in reactive hyperemia and increases in wall shear rate that signal vasodilatory molecules to be released from the endothelium eliciting vasodilation. Despite the thousands of studies performing flow-mediated dilation in humans, surprisingly, no studies have performed this technique non-invasively in living rats. Considering the recent shift in focus to translational research, the establishment of guidelines for non-invasive measurement of flow-mediated dilation in rats and other rodents would be extremely valuable. In the following article, a protocol is presented for the non-invasive measurement of flow-mediated dilation in brachial and superficial femoral arteries of rats, as those sites are most commonly measured in humans. The vascular endothelium is a cellular monolayer that lines the lumen of arteries and is an important regulator of vascular function. There are numerous molecules released from the endothelium that result in modulation of blood vessel diameter. Among these molecules, nitric oxide (NO), appears to be the primary vasodilatory molecule released from the vascular endothelium in response to stimulation (e.g., insulin, acetylcholine, or changes in shear stress)1. In the vascular endothelium, NO is produced by the enzyme endothelial NO synthase (eNOS) and is subsequently released from endothelial cells2. NO diffuses to the vascular smooth muscle where it causes relaxation and increased vessel diameter3. Endothelial dysfunction can be assessed non-invasively in humans using the flow-mediated dilation (FMD) technique4,5. FMD has been proposed to represent a functional bioassay for endothelium-derived NO bioavailability in humans, and is typically assessed at the brachial or superficial femoral artery in response to reactive hyperemia following a ~5 min limb occlusion6. Reactive hyperemia increases laminar shear forces that are transduced to the endothelial cell7, signaling a release of NO8. Although in recent years, the proportion of vasodilation initiated by NO release has been debated9,10, FMD is indicative of endothelium-dependent dilation and has consistently been shown to predict cardiovascular events11-13. To date, thousands of studies have employed the FMD technique for non-invasive measurement of endothelial function in humans. Considering the recent shift in focus to translational research, guidelines for the non-invasive measurement of FMD in rodents would be extremely valuable. Keeping with a translational approach, this protocol was established for measurement of FMD in brachial and superficial femoral arteries of rats, as those sites are most commonly measured in humans. This protocol results in a robust and repeatable FMD response in rats, however, measurement of FMD in rats is technically demanding and may be difficult for other investigators to replicate without video demonstration. Therefore, the following article will demonstrate a method for the non-invasive measurement of FMD in the brachial and superficial femoral arteries of rats. All animal procedures conformed to the Guide for the Care and Use of Laboratory Animals14 and were approved by the University of Utah and Salt Lake City Veterans Affairs Medical Center Animal Care and Use. Place animal in anesthesia induction chamber containing 3% isoflurane in 100% oxygen. Leave the animal in the induction chamber until it is unresponsive to external stimuli. Remove the animal from the induction chamber and place it on a heated examination table equipped with electrocardiogram (ECG) electrodes. Maintain anesthesia at 3% isoflurane in 100% oxygen. Brachial and superficial femoral artery FMD cannot be performed simultaneously. Therefore, preparation instructions for each measurement are listed below. Position the animal supine and restrain the left upper limb and each lower limb of the animal to the examination table with surgical tape. Restrain the right upper limb of the animal, so that the lower portion of the upper limb is slightly elevated (~0.2-0.5 cm) above the platform. Apply depilatory agent (e.g., Nair) to the animal's right upper limb to remove hair. Position an occlusion cuff (10 mm lumen diameter standard vascular occluder) on the right upper limb distal to the elbow. Do not rest the occluder on the platform, as inflation/deflation will move the limb and disturb ultrasound imagery. Set the ultrasound machine to B-mode using the ultrasound keyboard. Apply a small amount of ultrasound gel to the upper limb of the animal, proximal to the occlusion cuff. Manually align an ultra-high frequency linear array transducer attached to a stereotactic holder with the upper limb. The brachial artery should be visible 2-3 mm deep. To confirm that the brachial artery, not the brachial vein, is being imaged, switch to PW-mode using the ultrasound keyboard. The artery will have pulsatile blood flow as opposed to the adjacent vein which will have continuous blood flow. Position the animal supine and restrain the upper limbs and the left lower limb to the examination table with surgical tape. Restrain the right lower limb of the animal to an elevated position (~0.5-1 cm) above the platform using a pad (e.g., folded paper towels). Apply depilatory agent (e.g., Nair) to the animal's right lower limb to remove hair. After hair removal the femoral vein should be clearly visible at the upper inner thigh. Position an occlusion cuff (10 mm lumen diameter standard vascular occluder) proximal to the right ankle. Do not rest the occluder on the platform, as inflation/deflation will move the lower limb and disturb ultrasound imagery. Set the ultrasound machine to B-mode. Apply a small amount of ultrasound gel to the lower limb of the animal, proximal to the occlusion cuff. Manually align an ultra-high frequency linear array transducer attached to a stereotactic holder with the femoral vein, which is visible through the skin. The superficial femoral artery should be visible <1 mm deep. To confirm that the superficial femoral artery, not the femoral vein, is being imaged, switch to PW-mode. The artery will have pulsatile blood flow as opposed to the adjacent vein which will have continuous blood flow. Optimize the B-mode image, similar to how it would be done in humans15. Ensure that a horizontal, longitudinal image of the vessel with intima-media visualized in both walls is observed. Optimize the image by slightly adjusting the ultrasound probe placement to ensure that as much of the artery as possible is viewable in the capture window. Alternatively, adjust ultrasound settings to obtain a better image by changing the brightness/contrast, focal zones, frequency, dynamic range, and line density. There are other ways to optimize the ultrasound image, but detailed description of those are beyond the scope of this protocol. After optimization of artery imagery, turn on ECG-gating to display only images captured during the R-wave to ensure that only one diameter frame is collected are during each diastolic portion of a cardiac cycle. NOTE: ECG-gating is available on the ultrasound machine used in this protocol by selecting ECG-gating under the physiological settings option, however, this feature may not be available on all ultrasound machines. ECG-gating should be turned on after the image is optimized, as it is difficult to obtain an image at lower frame rates (i.e., once per R-wave). Without ECG-gating, the combination of a high heart rate in rats and requirement of a high frame rate to capture the diastolic portion of the cardiac cycle only allows for ~10-20 second clips. The cumbersome size and amount of data in each clip increases the analysis burden substantially. Record 60 seconds of baseline data using B-mode. NOTE: The ultrasound machine is always recording, however, not all images are stored on the ultrasound machine, as there is a limit on the number of frames that can be recorded in an ultrasound clip. The clip length (i.e., number of frames) can be adjusted in the settings. It is suggested to set for maximum number of frames per clip. When the recording is at the end of a clip (i.e., maximum number of frames reached), the recording continues, but the clip rolls forward capturing the most recent frames. In this case, earlier frames that were captured outside of the maximum frame limit are subsequently deleted. While these intricacies in recording differ between machines, adjustment of recording length may be necessary. Switch to PW-mode. Place the cursor in the middle of the lumen. Sample gates will be placed automatically in reference to the cursor, but can be adjusted for width using the ultrasound keyboard. Maintain an insonation angle of ≤60°. Adjust the insonation angle by altering the Doppler beam angle. Make fine adjustments to the angle by using the ultrasound keyboard. If neither of these provide an angle suitable for measurement, manually adjust the ultrasound probe by tilting the artery to a more optimum angle. If any adjustment of the ultrasound angle is performed, recapture B-mode images. Record 10 seconds of velocity data. Inflate the vascular occluder using an air-filled 10 ml syringe. To keep air pressure constant in the vascular occluder, fold the tube on itself and place a binder clip on the folded tube. Switch to PW-mode to confirm cuff occlusion, as evidenced by a large reduction in blood velocity. Switch to B-mode and record data in 60 second clips, until 4:45 min of occlusion. Switch to PW-mode. Keep a record of heart rate and the time of each ultrasound clip for analysis. Release the cuff while recording in PW-mode by removing the binder clip from the folded tube. Record 5 seconds prior to and 5 seconds after cuff release. Switch to B-mode and record data in 60 second clips until 3 minutes after occlusion. Keep a record of heart rate and the time of each ultrasound clip for analysis. After completion of FMD remove the animal from the examination table and monitor until it has regained sufficient consciousness to maintain sternal recumbency. For analysis, export ultrasound as DICOM files to an offline computer equipped with edge-detection software, which allows for unbiased determination of artery diameter at each frame. Analysis is possible on the ultrasound machine, however, it not recommended, as it is extremely time intensive and subject to investigator bias. Analyze artery diameter data in 60 second segments during baseline and occlusion phase, and in 10 second segments during the hyperemic phase. Analyze blood velocity data using the flow analysis capabilities of the automated edge-detection software. Determine average blood velocity by measuring 5 or more consecutive waveforms of uniform appearance during baseline and occlusion phases. Determine average blood velocity during reactive hyperemia for blood velocities immediately after cuff release. The waveform with highest blood velocity is considered peak blood velocity. Flow-mediated dilation was performed on the brachial and superficial femoral artery of 8 Wistar rats. Positioning of a rat is shown in Figure 1. Representative ultrasound images of the superficial femoral artery are shown in Figure 2. Figure 1. Rat and ultrasound positioning. Positioning of rat for measurement of brachial (A) and superficial femoral (B) artery FMD. Positioning of ultrasound probe and occlusion cuff for measurement of brachial (C) and superficial femoral (D) artery FMD. Please click here to view a larger version of this figure. Figure 2. Representative ultrasound images. Ultrasound image of the superficial femoral artery using B-mode imaging for determination of diameter (A). Blood velocity was determined using PW-mode. Shown in the figure are blood velocity at baseline (B), the reduction in blood velocity during the occlusion phase (C), and the rapid increase in blood velocity at cuff release during the hyperemic phase (D). Please click here to view a larger version of this figure. As shown in Figure 3, there is a similar vasodilatory response between the brachial and superficial femoral arteries. When expressed as a percent of baseline, FMD was similar between arteries, however when expressed as an absolute change from baseline, FMD was significantly higher in the brachial artery (P<0.05). This difference is likely due to a larger vessel diameter in the brachial artery than in the superficial femoral artery (498±28 vs. 397±11 µm, P<0.05). Similar to measurement of FMD in humans16, intersession coefficient of variation for brachial and superficial femoral FMD were 9±1 and 10±4%, respectively. Despite differences in vessel size, there was a strong linear relationship between brachial and superficial femoral artery FMD when expressed as a percent or absolute change from baseline. Figure 3. Flow-mediated dilation in rats. Vasodilation of the brachial and superficial femoralartery following a 5 min period of limb ischemia expressed as percent (A) and absolute (B) change from baseline. FMD was similar between arteries when expressed as a percent of baseline (C). However, when expressed as an absolute change from baseline (D), FMD was significantly higher in the brachial artery. Whether expressed as a percent (E) or absolute (F) change from baseline, there was a strong relationship for FMD between brachial and superficial femoral arteries. * P<0.05 vs. Brachial Artery. Values are mean ± SEM. Please click here to view a larger version of this figure. As shown in Table 1, cardiovascular variables were measured during baseline, occlusion, and hyperemic phases. Artery diameter was determined using the intima-to-intima or media-to-media distance during the diastolic portion of the cardiac cycle. Artery diameter was measured for 60 seconds at baseline and continuously in ~60 second intervals through the occlusion and hyperemic phases. Blood velocity was determined using the mean arterial velocity of blood in the lumen during one cardiac cycle. Blood flow was calculated as per the equation: blood flow (µl/min) = (blood velocity (µm/sec) · π · [vessel diameter (µm)/2]2 · 60). Shear rate was calculated according to the equation: shear rate (s-1) = blood velocity · 8/vessel diameter. FMD was calculated according the equation: FMD = (peak vessel diameter - baseline vessel diameter)/baseline vessel diameter. * P<0.05 vs. Brachial Artery. † P<0.05 vs. Baseline Phase. ‡ P<0.05 vs. Occlusion Phase. Table 1. Cardiovascular variables through each phase of the protocol. There were no changes in heart rate throughout either protocol, as well as between artery measurements (P>0.05). The diameter of the brachial artery was significantly larger than the superficial femoral artery (P<0.05). During the occlusion phase, there was a significant reduction in blood velocity, blood flow, and shear rate compared to baseline in both arteries (P<0.05). Following cuff release, peak blood velocity, blood flow, and shear rate were all significantly higher than baseline or occlusion phases in both arteries (P<0.05). Similar to measurement of reactive hyperemia in humans16, intersession coefficient of variation for brachial and superficial femoral reactive hyperemia were 24±9 and 19±5%, respectively. There were differences in blood velocity, blood flow, and shear rate between arteries, owing in large part to the difference in artery diameter. After normalizing to peak shear rate, vasodilation was higher in the brachial artery (Figure 4). This was also true for FMD expressed as an absolute change from baseline. However, despite differences in magnitude, there was a strong linear relationship in percent and absolute FMD normalized to peak shear rate between the brachial and superficial femoral artery. Figure 4. Flow-mediated dilation normalized to peak shear rate in rats. After normalizing to peak shear rate, FMD expressedas a percent (A) or absolute change (B) from baseline was higher in the brachial artery compared to the superficial femoral artery. Despite differences between arteries in FMD normalized to peak shear rate, there was a strong relationship between brachial and superficial femoral arteries when FMD was expressed as a percent (C) or absolute change (D) from baseline. * P<0.05 vs. Brachial Artery. Values are mean ± SEM. Please click here to view a larger version of this figure. In the present study, a non-invasive measurement of FMD was demonstrated in the brachial and superficial femoral arteries of rats. Similar to humans6, following a 5 min occlusion period, there was a rapid increase in blood velocity (i.e., reactive hyperemia) thereby increasing shear rate on the arterial wall which resulted in the subsequent vasodilation of the artery. FMD was observed in both the brachial and superficial femoral arteries. Additionally, there was a strong relationship in FMD between arteries. Although peak shear rate was higher in the superficial femoral artery, FMD normalized to peak shear rate maintained a strong relationship between arteries. Together, these results indicate that non-invasive measurement of FMD can be successfully performed in rats. Although measurement of FMD was performed on two different arteries, the magnitude of FMD was similar when expressed as a percent change from baseline. However, when expressed as an absolute change from baseline, FMD was higher in the brachial artery, as that artery had a ~25% larger resting diameter than the superficial femoral artery. These results are similar to those of human studies in which FMD was measured in the brachial and superficial femoral arteries in the same subjects17,18. Despite the differences in arterial diameter, the relationship of FMD, expressed as a percent or absolute change from baseline, was extremely strong between arteries. Flow-mediated dilation has been proposed to represent a functional bioassay for endothelium-derived NO bioavailability in humans6, as vasodilation occurs via NO release from the endothelium in response to increased shear rate1,3. Thus, a higher FMD normalized to peak shear rate represents an endothelium that has increased sensitivity a given increase in shear rate. 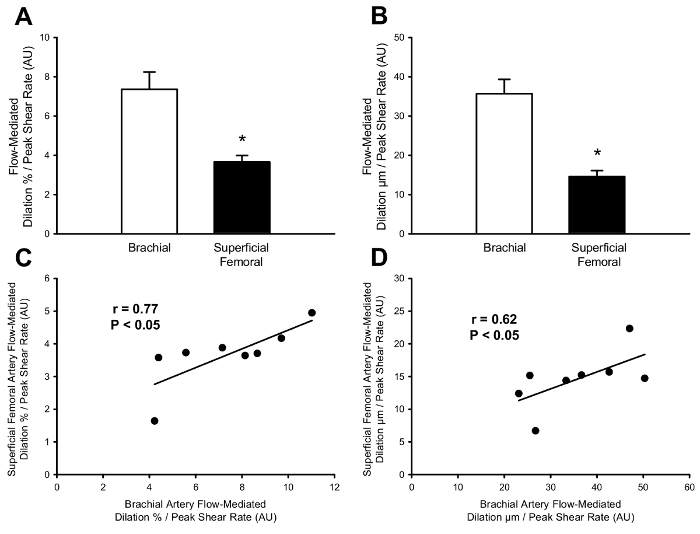 After normalizing FMD to peak shear rate, FMD was higher in the brachial artery, regardless of whether it is expressed as a percent or absolute change from baseline. Despite differences in magnitude of FMD normalized to peak shear rate between brachial and superficial femoral arteries, there was a strong linear relationship in percent and absolute FMD normalized to peak shear rate between arteries. In the present study, the non-invasive measurement of FMD is described in the brachial and superficial femoral arteries with cuff occlusion distal to the ultrasound probe. This cuff placement was selected for several reasons, 1.) in humans, this is most commonly used method for measuring FMD, 2.) the contribution of NO to FMD has been shown to be greater when artery diameter measurement is proximal to occlusion site9, and 3.) there was difficulty in maintaining the ultrasound image after cuff inflation when the measurement site was distal to occlusion. 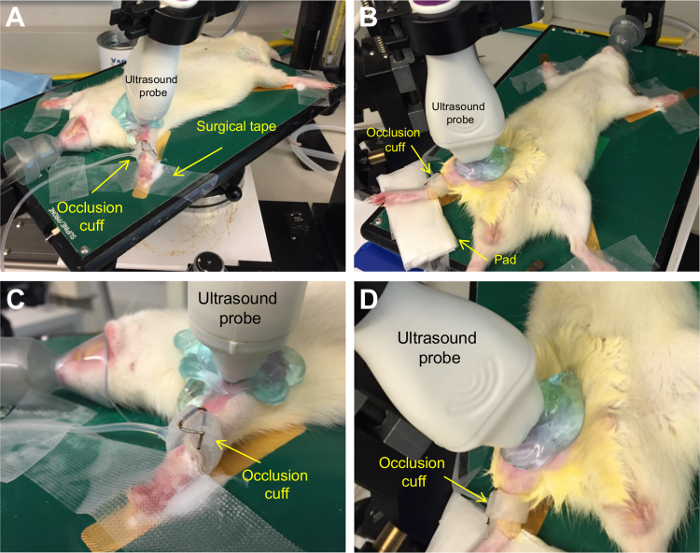 Although this procedure represents a non-invasive measurement of FMD, others have performed FMD in living rats using a surgical occlusion of the common iliac artery with ultrasound measurement distal to occlusion in the femoral artery19. The FMD response using the protocol first described by Heiss et al. was inhibited by infusion of eNOS inhibitors. Indeed, this procedure has been used to demonstrate that pharmacological increases in intracellular NO improves FMD in two rat models of endothelial dysfunction and hypertension20, and exposure to secondhand smoke results in an impairment of FMD in rats21,22. These studies demonstrate the contribution of NO to FMD in rats and establish the relation of FMD to cardiovascular health. However, as this technique is invasive, it might limit the ability to measure FMD longitudinally in the same rats over a period of weeks to years. Using a similar method to the present study, two recent studies have performed non-invasive measurement of FMD in the hind limb of mice23,24, but there were several technical variations between studies (i.e., measurement time course and placement of ultrasound probe and occlusion cuff). Due to discrepancies between these studies and difficulty in replicating these results, the non-invasive measurement of FMD in rats was attempted instead, as rats are commonly used in translational research, but have a larger body and blood vessel size than mice. While measurement of FMD in the femoral artery of rodents is not generally novel, no study has performed measurement of FMD in the brachial artery of any living rodents. The strong relation of FMD between limbs in the present study may illustrate the systemic nature of endothelial function, but also provides a method to non-invasively measure FMD in animals that have disrupted blood flow in the hind limbs (e.g., femoral arteriovenous fistula). The optimization and maintenance of a high quality ultrasound images are critical skills required for this procedure and requires extensive practice. For example, for measurement of FMD in humans, it is suggested that at least 100 supervised scans are performed before scanning independently5. At times, the image may shift during cuff occlusion and require slight adjustments of the ultrasound probe. A critical step in this protocol is switching between B-mode and PW-mode at specific time points. Simultaneous B-mode and PW-mode imaging are not possible on the ultrasound machine used in this protocol. Therefore, it is required to quickly switch between ultrasound modes to capture velocity and diameter measurements during specific time segments. Having a written out protocol and practice performing the protocol will greatly improve the efficiency of switching between ultrasound modes. Considering the time-sensitive nature of ultrasound recordings during this protocol, errors will occur, so be prepared to note down any protocol abnormalities, such as forgetting to capture an ultrasound clip. Missing an ultrasound clip during the occlusion phase is not critical, however, if a recording is lost during the reactive hyperemia phase it is suggested to perform the procedure again after at least 30 min have passed25. As with any study there are limitations to the experimental protocol. In this study, anesthesia was administered to rats under 100% oxygen, thus, measurements of FMD might also reflect vasoreactivity to hyperoxia. Other forms of anesthesia, such as sodium pentobarbital could be used to create a more representative blood gas profile to humans and eliminate this concern. Blood pressure was not monitored at any point of this protocol. Although blood pressure does not change in response to acute cuff occlusion in humans, it is unknown if any transient change in blood pressure would occur in rats. Additionally, compressed air was used to fill the vascular occluder, however, filling with water may have resulted in a firmer occlusion of blood flow as water it is not as compressible as air. Lastly, non-invasive measurement of FMD under conditions in which eNOS is inhibited (i.e., L-NMMA infusion) have not been performed. Thus, the contribution of NO to FMD, as it is performed in this protocol, has not been determined. In conclusion, this article has demonstrated a protocol for the non-invasive measurement of FMD in the brachial and superficial femoral arteries of rats. In conjunction with the recent shift in focus to translational research, the assessment of FMD in rats may provide a valuable tool for translating results in humans to rats, as well as provide the ability to assess endothelial function at several time points in longitudinal studies of rats receiving different treatments. Indeed, reductions in FMD are accompanied by aortic arterial stiffening have been observed following kidney damage in a rat model of chronic kidney failure (unpublished findings), which demonstrates the application of non-invasive FMD as a marker of vascular function in longitudinal animal studies. Future studies to investigate mechanisms of FMD in rats are warranted and would provide further insight into non-invasive FMD measurement in humans. All animal imaging was performed at the Small Animal Imaging Core Facility, University of Utah. This study was funded in part by grants from the National Institutes of Health (R21 AG043952, R01 AG040297, K01 AG046326, K02 AG045339, and R01 DK100505). Smits, P., et al. Endothelial release of nitric oxide contributes to the vasodilator effect of adenosine in humans. Circulation. 92, 2135-2141 (1995). Forstermann, U., et al. Nitric oxide synthase isozymes. Characterization, purification, molecular cloning, and functions. Hypertension. 23, 1121-1131 (1994). Gardiner, S. M., Compton, A. M., Bennett, T., Palmer, R. M., Moncada, S. Control of regional blood flow by endothelium-derived nitric oxide. Hypertension. 15, 486-492 (1990). Harris, R. A., Nishiyama, S. K., Wray, D. W., Richardson, R. S. Ultrasound assessment of flow-mediated dilation. Hypertension. 55, 1075-1085 (2010). Corretti, M. C., et al. Guidelines for the ultrasound assessment of endothelial-dependent flow-mediated vasodilation of the brachial artery: a report of the International Brachial Artery Reactivity Task Force. J Am Coll Cardiol. 39, 257-265 (2002). Celermajer, D. S., et al. Non-invasive detection of endothelial dysfunction in children and adults at risk of atherosclerosis. Lancet. 340, 1111-1115 (1992). 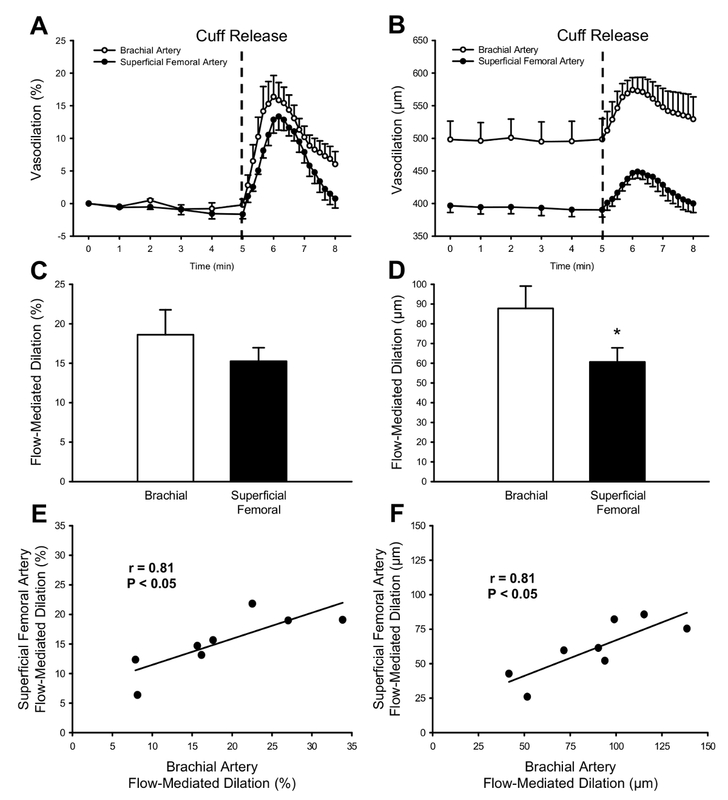 Niebauer, J., Cooke, J. P. Cardiovascular effects of exercise: role of endothelial shear stress. J Am Coll Cardiol. 28, 1652-1660 (1996). Sessa, W. C. eNOS at a glance. J Cell Sci. 117, 2427-2429 (2004). Wray, D. W., et al. Does brachial artery flow-mediated vasodilation provide a bioassay for NO? Hypertension. 62, 345-351 (2013). Green, D. J., Dawson, E. A., Groenewoud, H. M., Jones, H., Thijssen, D. H. Is flow-mediated dilation nitric oxide mediated? A meta-analysis. Hypertension. 63, 376-382 (2014). Green, D. J., Jones, H., Thijssen, D., Cable, N. T., Atkinson, G. Flow-mediated dilation and cardiovascular event prediction: does nitric oxide matter? Hypertension. 57, 363-369 (2011). Brevetti, G., Silvestro, A., Schiano, V., Chiariello, M. Endothelial dysfunction and cardiovascular risk prediction in peripheral arterial disease: additive value of flow-mediated dilation to ankle-brachial pressure index. Circulation. 2093-2098 (2003). Gokce, N., et al. Predictive value of noninvasively determined endothelial dysfunction for long-term cardiovascular events in patients with peripheral vascular disease. J Am Coll Cardiol. 41, 1769-1775 (2003). National Research Council (U.S.). Guide for the care and use of laboratory animals. 8th, National Academies Press. (2011). 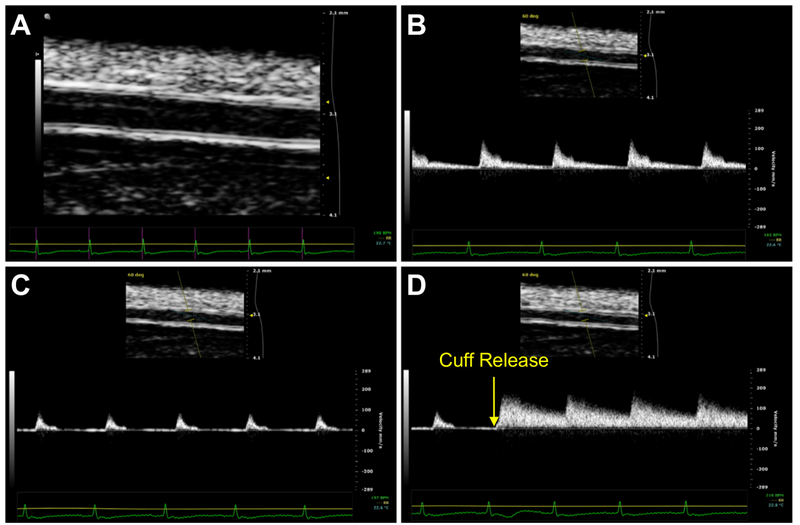 Alley, H., Owens, C. D., Gasper, W. J., Grenon, S. M. Ultrasound assessment of endothelial-dependent flow-mediated vasodilation of the brachial artery in clinical research. J Vis Exp. e52070 (2014). Ghiadoni, L., et al. Assessment of flow-mediated dilation reproducibility: a nationwide multicenter study. J Hypertension. 30, 1399-1405 (2012). Thijssen, D. H., et al. Heterogeneity in conduit artery function in humans: impact of arterial size. Am J Physiol Heart Circ. 295, H1927-H1934 (2008). Green, D. J., et al. Why isn't flow-mediated dilation enhanced in athletes? Med Sci Sports. 45, 75-82 (2013). Heiss, C., et al. In vivo measurement of flow-mediated vasodilation in living rats using high-resolution ultrasound. Am J Physiol Heart Circ. 294, H1086-H1093 (2008). Chen, Q., et al. Pharmacological inhibition of S-nitrosoglutathione reductase improves endothelial vasodilatory function in rats in vivo. J Appl Physiol. 114, 752-760 (2013). Pinnamaneni, K., et al. Brief exposure to secondhand smoke reversibly impairs endothelial vasodilatory function. Nicotine Tob Res. 16, 584-590 (2014). Liu, J., et al. Impairment of Endothelial Function by Little Cigar Secondhand Smoke. Tob Regul Sci. 2, 56-63 (2016). Schuler, D., et al. Measurement of endothelium-dependent vasodilation in mice--brief report. Arterioscler Thromb Vasc Biol. 34, 2651-2657 (2014). Erkens, R., et al. Left ventricular diastolic dysfunction in Nrf2 knock out mice is associated with cardiac hypertrophy, decreased expression of SERCA2a, and preserved endothelial function. Free Radic Biol Med. 89, 906-917 (2015). Harris, S. A., Billmeyer, E. R., Robinson, M. A. Evaluation of repeated measurements of radon-222 concentrations in well water sampled from bedrock aquifers of the Piedmont near Richmond, Virginia, USA: : effects of lithology and well characteristics. Environmental research. 101, 323-333 (2006).